I posted a picture of Reggie Bush wearing an “I can’t breathe” shirt on Facebook ……And then ‘Murica showed up. Posted on December 7, 2014 by Zo! Earlier today while checking out some football on NFL RedZone, I came across a picture of running back Reggie Bush with a Detroit Lions shirt on in pre-game warmups that read, “I can’t breathe” across it representing the last words spoken repeatedly by Eric Garner as he was brutally choked to death on camera by NYPD officer Daniel Panteleo. Being that Reggie plays for my hometown team, I decided to post the picture in support – First on twitter and then on my Facebook fan page. Surprisingly, only two or three trolls made appearances in the good ole mentions after the picture began making its rounds on Twitter. Meanwhile, over in the wonderful world of Facebook, Folks from my fan page clicked the “like” button numerous times and also shared the picture, but there were no comments made just yet. …Ok, excellent. ……Then I dozed off for an hour and some change. …And woke up to a “comments” section that looked like Rosewood. Apparently the post was “shared” with one or two folks who disagreed with the shirt thus opening the floodgates for trolls and cowards worldwide. <95% of the people who showed up in the comments aren’t even a part of my page or music following at all. It seemed as though most of these folks couldn’t wait to log in to Facebook and show off their slow lane talents in the art of trying to out-ignorant one another. It really does this thread no justice for me to sit here and attempt to explain the grade-A level fuckery contained within it. The masks usually come all the way off in situations like this, so it’s always good to be mindful that when reading through a thread like this, these folks could very well be your neighbors, your co-workers ….or hell, a friend of yours. I invite you to click below and check them in all their unfiltered glory. Posted on November 4, 2009 by Zo! 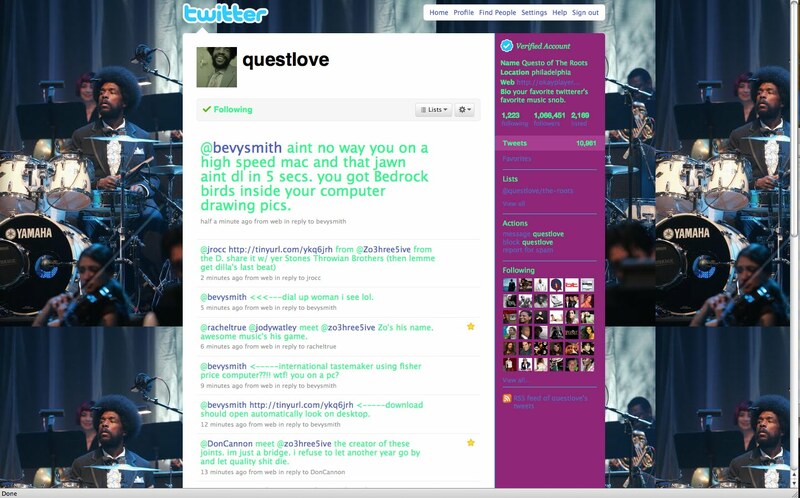 Bevy Smith – @questlove What a lovely soundtrack 2 wake up 2, thanks for hipping me (I’m 43,I can say hipping)! 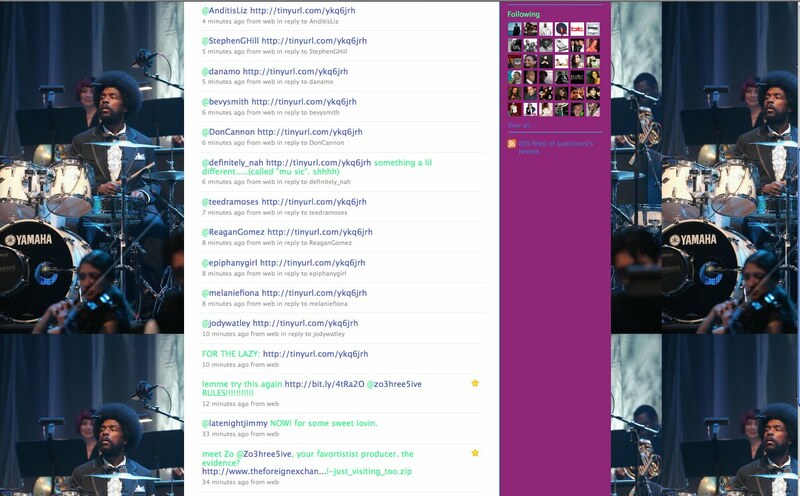 @Zo3hree5ive divine music, merci baby! Rachel True – Super groovy, wanna hear more!!! why would i doubt @questlove &amp; countless others! Stephen Hill – @questlove || appreciate this, my MJ shirt partner!! love good listening! Huge shouts to Questlove once again… He didn’t even have to do this…. but he DID.